Photo of a classic kitchen in Orange County with stainless steel appliances and a belfast sink. 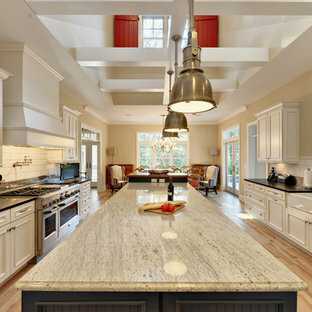 Photo of a large traditional u-shaped enclosed kitchen in New York with integrated appliances, recessed-panel cabinets, grey cabinets, marble worktops, an island, a submerged sink, grey splashback and white floors. This is an example of a classic kitchen/diner in Boston with raised-panel cabinets, white cabinets, limestone splashback and brown worktops. 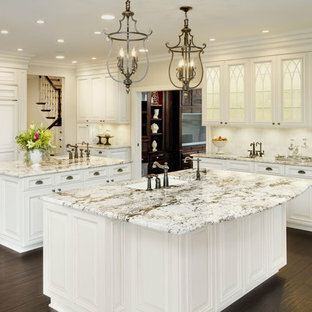 This is an example of a classic kitchen in Chicago with glass-front cabinets, a single-bowl sink, white cabinets, granite worktops and integrated appliances. This is an example of a large traditional kitchen/diner in Portland with stainless steel appliances, recessed-panel cabinets, white cabinets, white splashback, metro tiled splashback, granite worktops, a submerged sink, dark hardwood flooring, multiple islands and black worktops. 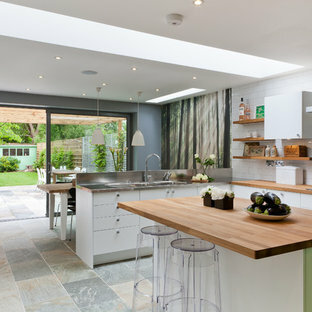 This is an example of a medium sized contemporary kitchen/diner in Other with an integrated sink, flat-panel cabinets, white cabinets, wood worktops, white splashback, an island and metro tiled splashback. 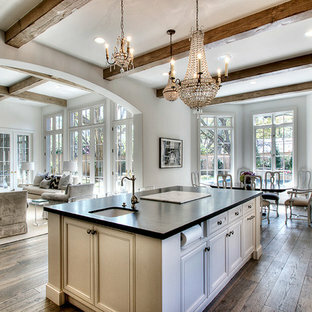 Inspiration for a traditional open plan kitchen in Houston with a single-bowl sink, recessed-panel cabinets, beige cabinets and black worktops. Inspiration for a beach style kitchen/diner in Philadelphia with stainless steel appliances, metro tiled splashback, a belfast sink, granite worktops, recessed-panel cabinets, white cabinets, white splashback and black worktops. This kitchen features Venetian Gold Granite Counter tops, White Linen glazed custom cabinetry on the parameter and Gunstock stain on the island, the vent hood and around the stove. The Flooring is American Walnut in varying sizes. There is a natural stacked stone on as the backsplash under the hood with a travertine subway tile acting as the backsplash under the cabinetry. Two tones of wall paint were used in the kitchen. Oyster bar is found as well as Morning Fog. 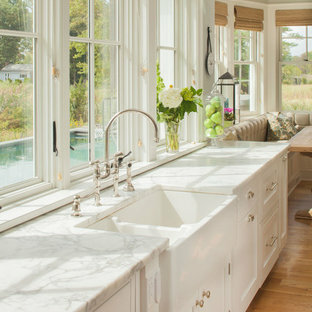 Classic kitchen in New York with glass-front cabinets, a belfast sink and wood worktops. Inspiration for a nautical galley kitchen in Jacksonville with matchstick tiled splashback, marble worktops, shaker cabinets, white cabinets, stainless steel appliances and multi-coloured splashback. 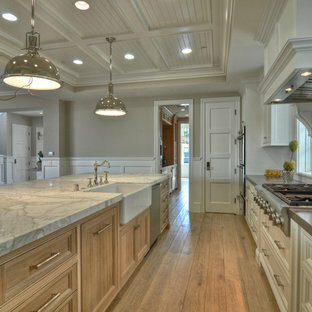 Photo of a large traditional u-shaped enclosed kitchen in New York with marble worktops, shaker cabinets, white cabinets, integrated appliances, white splashback, stone slab splashback, medium hardwood flooring and an island. This is an example of a large victorian galley enclosed kitchen in Melbourne with a submerged sink, raised-panel cabinets, white cabinets, marble worktops, white splashback, ceramic splashback, stainless steel appliances, an island and dark hardwood flooring. 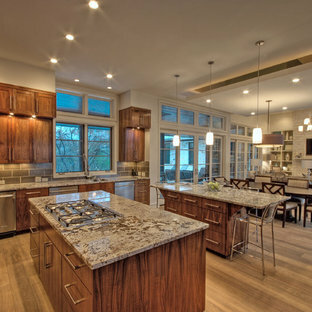 This is an example of a classic kitchen/diner in Minneapolis with white cabinets.